Fits Automatic valve body applications. Use with large 1.875 Spicer yoke for 2 wheel drive models.Has 4 inch tailshaft and 7 inch separation on top bellhousing bolts. Transmission shipped without speedometer driven gear or housing. 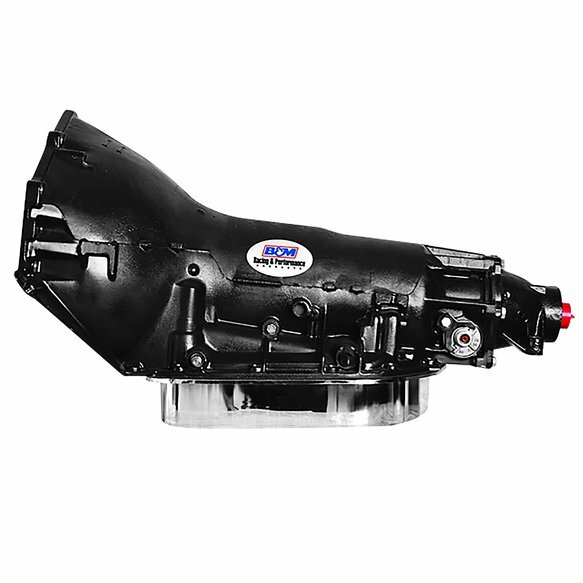 The B&M TH-400 PreRunner/Trail automatic transmission is for RWD GM SB/BB applications. This transmission features a large diameter bushing for use with a large diameter yoke (1-7/8 in) and includes a deep, cast aluminum pan. This transmission also features an automatic/forward valve body, a 2.48:1 first gear ratio, 1.48:1 second gear, rebuilt front pump (utilizes B&M pressure regulator spring and shims), all new B&M high performance friction plates, new intermediate roller clutch, new kickdown band with welded anchors, machined center support with new case saver ring, all new thrust bearings and races, and new adjustable modulator and silencer ring, Max 600 HP / 550 Ft/Lbs. Intended for off road/trail use.